Brand New Genuine Silvercross Sky Blue Pram Parasol. Also comes with parasol connector and surf all terrain parasol clamp. *wayfarer parasol clamp not included Sending with My Hermes. Silver Cross Seat Liner Black/Sand. This luxury seat liner has been specially developed to be compatible with both the Silver Cross Surf and Wayfarer pushchair seats. The ergonomically designed seat pad fits effortlessly into the stroller seat, and the 5 point safety harness fits neatly through the reinforced strap apertures to ensure your child is safe and secure. The ergonomically designed seat pad fits effortlessly into the stroller seat, and the 5 point safety harness fits neatly through the reinforced strap apertures to ensure your child is safe and secure. Our parasols are waterproof. Our Baby Parasol/umbrella fits all buggies/prams and pushchairs. Also with the quick release clip you can simply detach the parasol quickly and hastle free of unwinding and re-winding the clamp. 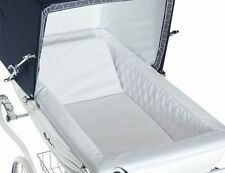 Pram canopy to fit Silver Cross prams in white with WHITE BORDER DETAIL and white b/a lace to match. The canopy is made from polycotton Broderie Anglaise fabric. The canopy has 3 layers of fabrics and machine washable ,one layer is the anti glare fabric which is in the middle. Fits both balmoral and Kensington size coach built prams. Beautiful teddy lace fabric pram quilt and pillowcase set to match. 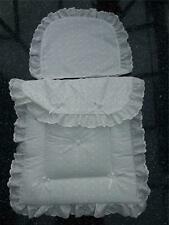 The pram set is finished off with beautiful white teddy lace fabric frill to match, and five white bows. Silver Cross Surf MOSQUITO Net/ UV Sun Protection. This raincover fits to Surf 1,2,3 seat unit or carrycot. Fits both seat unit and carrycot. silver cross wayfarer and pioneer Rain cover great condition as new. The dual purpose Zest Footmuff from Silver Cross is perfect for keeping your child warm and snug with its soft and cosy fleece inner lining. What's more the footmuff is easily detachable with a side zip to reveal a luxurious seat liner, making this perfect all year round. RAIN COVER FOR SILVER CROSS 3D PRAM STSTEM. Non toxic lead free and cadmium free, Gives protection from wind and rain. Compact fold for easy storage. Glass clear for excellent visibility. Custom made to fit. Silver Cross Pioneer/Wayfarer Hood and Apron Colour Pack in Red & Chrome Hood Apron The top part of the cosy toes also zips on Silver Cross Wayfarer/ Pioneer Seat And carrycots; this doesn’t have the fold over flaps to hide the zip This colour pack has been used and is in good condition but there are some scratches to the chrome frame on the hood and minor marks to the fabric. - (see photos please ) The hood and apron fit both the seat unit and the carrycot. Thank you for looking!!! GENUINE SILVER CROSS FOOTMUFF. THIS FOOTMUFF WAS DESIGNED FOR THE SILVER CROSS 3D STROLLER. 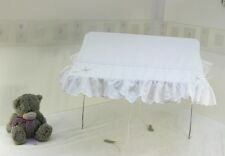 DOLLS Ivory pram bedding set complete with pram set and pillow, made from beautiful all over teddy design polyester lace fabric.The pram set is finished off with beautiful ivory teddy lace frill to match and 5 cream sparkle bows. This will make a fab Christmas Gift. Help to keep your little one shades from the sun's glare when out and about in their Silver Cross Surf or Wayfarer pushchair. The parasol is made from a UV material to provide optimum protection and should be angled into position to ensure your little one is properly shaded. Silver Cross Surf Pram Rain Cover, Black. Condition is Used. Dispatched with Royal Mail 2nd Class. Ivory pram bedding set complete with pram set and pillowcase., made from beautiful all over teddy design polyester lace fabric.The pram set is finished off with beautiful ivory teddy lace frill to match and 5 cream sparkle bows. Silver Cross Parasol in raspberry, hardly used in excellent condition, comes with all fittings to fit pioneer, wayfarer or surf prams. Footmuff Compatible with Silver Cross Buggy Puschair Stroller Pram Black Jack. This footmuff has been expertly designed Compatible with all buggies, strollers and push chairs with ease, so you will not have to fork out on any of the expensive compatible accessories that are on the market. New Silver Cross parasol to fit Pioneer/Wayfarer/Surf in Sky Blue. (HThis Silver Cross Zest buggy Foot Muff is super soft fleece on the inner to keep your loved one cosy warm:-) hurry these won’t be around long at this deal. The canopy has 3 layers of fabrics and machine washable ,one layer is the anti glare fabric which is in the middle. The hood and apron fit both the seat unit and the carrycot. Silver cross wayfarer raincover. Used But still in good condition, no tears & zip works perfectly. Dispatched with Royal Mail 2nd Class. This footmuff has been expertly designed Compatible with the Silver Cross. The outer cover of this footmuff is designed to resist rain and wind. 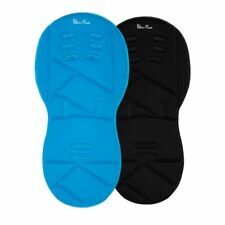 The main features of the Black Footmuff Compatible with Silver Cross are. Silver Cross Surf Pram Mosquito Net in black. Condition is very good Used. Hardly ever used, fits Silver Cross Surf Pram. I wouldn't list anything I wouldn't want to receive myself. Silver Cross Wayfarer Pioneer rain cover VGc genuine . Condition is Used. Dispatched with Royal Mail 2nd Class. Silver Cross Wayfarer Raincover in excellent used condition. I am away from 15th to 26th April, purchases will need to be made by 12 lunchtime on 14th to be dispatched b4 I go. Genuine Reversible Seat Liner for Pioneer / Wayfarer - Vintage Red . Condition is New. Dispatched with Royal Mail 2nd Class. Condition isVery good. Fits both seat unit and carrycot. Clean and ready to use.